Love your business but working much harder than before? Then you probably need to systemize. 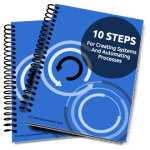 I'll show you how in this guide with 10 easy steps to help you get systems in place that will automate your business and make it run like a well-oiled machine. Now, you will be able to focus on growing your business. Not running it. As a bonus, you will also receive regular tips, suggestions, special offers and answers to your technical issues.